Zozobra beginning to burn in Santa Fe, New Mexico. Photo by Jen Judge. The moaning is getting louder,more guttural. The giant puppet is really mad now, flailing his arms about angrily. His eye sockets are glowing an eerie green, his pupils flickering a menacing red. As the fire dancer waves his torches in the foreground, taunting Zozobra, blasts of fireworks begins shooting up faster and faster. The mariachi band picks up the tempo, and the crowd, some 50,000 strong, begin hurtling toward escape velocity. As the tequila-fueled chants of “Burn him! Burn him!” intensify, I become worried that some members of my party, most of whom are visiting from out of town, might be temporarily worried for their safety. I had done my best to explain my adopted hometown’s annual cleansing ritual, stressing that while, yes, it’s a bit bonkers, it’s also (mostly) family-friendly. At my encouragement, many of them had, like me, brought their young children to the spectacle. The festival features mariachi bands, dancers and fireworks, all leading up to the big burn. Photo by Charles Mann/Alamy. But now I am wondering if my decision — to downplay how totally and completely unhinged the crowd gets right before Old Man Gloom, as the 50-foot marionette is called, goes up in flames — is a good one. Several quick glances about the group ease my concerns. My nephew Ben is laughing hysterically atop my brother-in-law’s shoulders, waving his glow sticks furiously. I look over to see my cousin Donny yell, “You’re going down, Zozobra!” with alarming fervor. 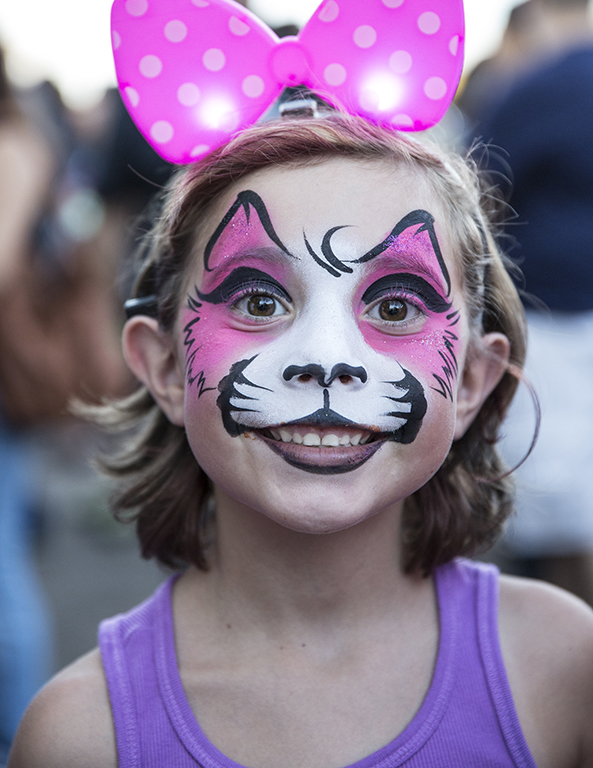 Zozobra’s festive atmosphere makes it a community crowd pleaser. Photo by Jen Judge. The truth is, in this day and age of PG-rated fun runs and strict open-container laws, the fact that an event as wild and frenetic as Zozobra not only still exists, but is championed by the city and sponsored by the Kiwanis Club, can be hard to comprehend. I should know. When I first moved to Santa Fe, I too had a hard time wrapping my head around the event’s mythology. It wasn’t until I experienced my first “burn” — as locals refer to the evening’s pageantry — that I truly understood it. 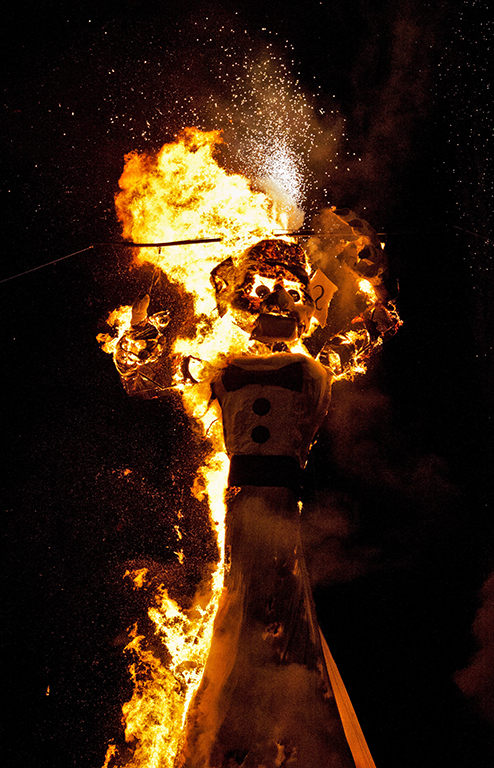 You’ll sometimes hear locals boast that Zozobra is the original Burning Man, but that’s not quite right. “Something burns, but that’s about where the similarities with Burning Man end,” says Matt Horowitz, the chairman of the construction committee, aka the guy in charge of actually building the big guy every year. A better way to put it: “It’s Santa Fe’s New Year’s,” says Ray Sandoval, the event chairman. The event, held every September, dates to 1924, when a local artist named Will Shuster made the entire thing up from scratch. Every autumn, for the past 300-plus years, the city has held a weeklong event, La Fiesta de Santa Fe, or “the Fiestas” as everyone refers to the festivities, a predominantly Catholic celebration commemorating the reconquering of the area by the Spanish on Sept. 14, 1692, after their ousting by local Pueblo Indians 12 years earlier. A Santa Fean deposits her “gloom” for burning into one of the official boxes. Photo by Jen Judge. It’s a somber occasion, and Shuster and his pals decided to have their own, lighter-hearted event as a counterpoint. A friend came up with the name Zozobra, a Spanish word roughly translated as “gloom” or “anguish,” and Shuster burned the first one in his backyard to entertain his friends. “There’s a rich history of creativity and eccentricity in Santa Fe going back, well, forever, but it really flourished in the ’20s,” when the city’s bohemian art scene was gaining renown, says Horowitz. According to local lore, Shuster, a WWI veteran originally from Philadelphia, was inspired by a trip to Mexico where he witnessed the Holy Week celebrations of the Yaqui Indians, who led an effigy of Judas, filled with firecrackers, around their village on a donkey before setting the effigy alight. Originally, Old Man Gloom was only about 6 feet tall and resembled a conquistador. Over time, he’s gotten increasingly taller, but his signature look — a scary clown with big ears, a bow tie and a scowling expression — has remained the same since the ’30s. Every year there are minor variations: earrings, hands on backward, the one time in the ’70s he looked like Nixon. But the central narrative remains the same: “Gloomies” (kids dressed in white sheets) try to set Zozobra free, torchbearers scare them off and then the fire dancer finally appears to do him in. In the ’90s, event organizers began accepting physical “glooms,” tax papers, bills, parking tickets, divorce papers and the like. 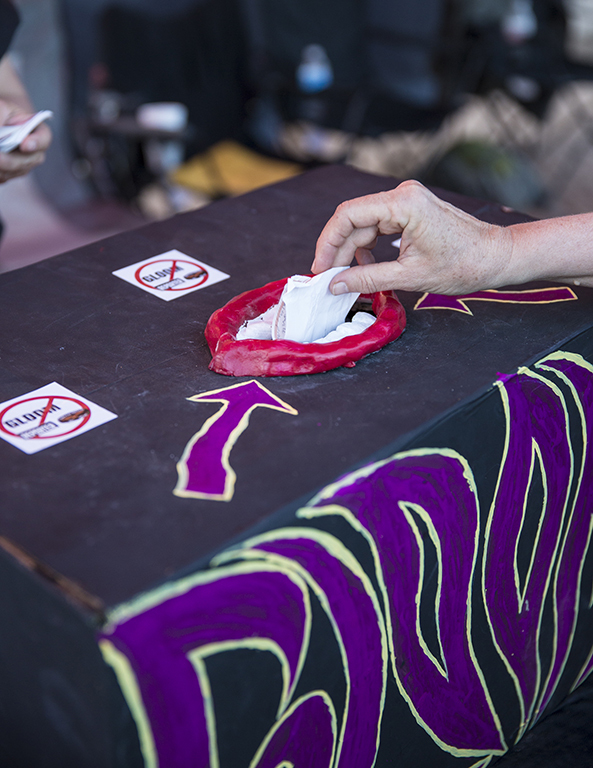 Officials now put out “gloom boxes” around town and, as of last year, you can now email your glooms to event organizers, who will print them out and physically stuff ’em in the big guy right before he burns. 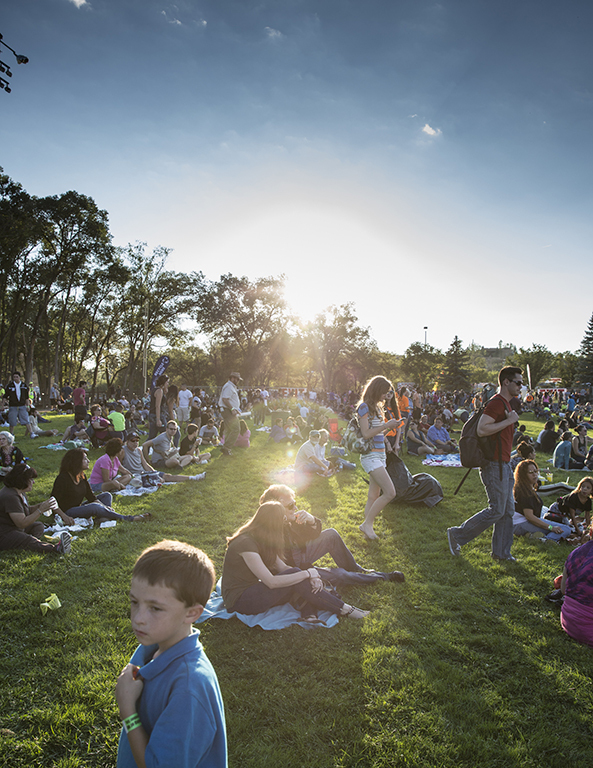 School kids go on field trips to watch Zozobra come to life, and there’s even a ZozoFest a few days before the burn to further stoke anticipation. 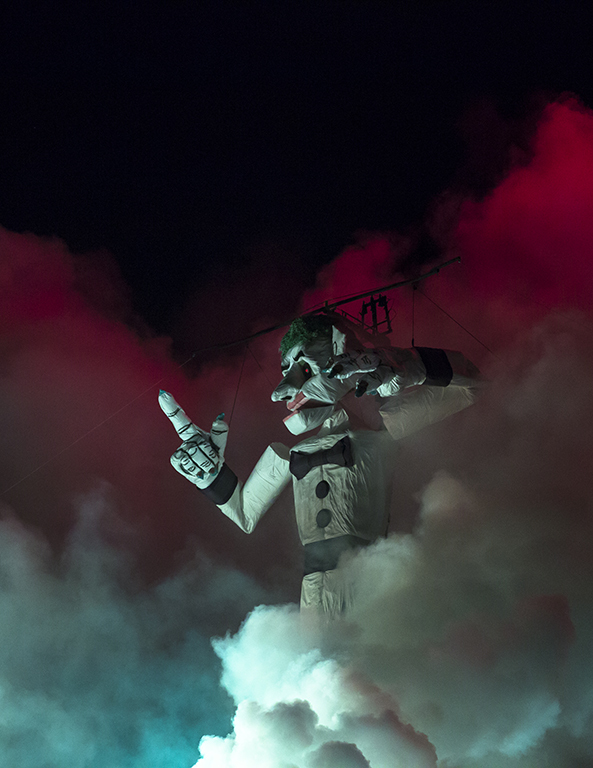 A fairly family-friendly affair, Zozobra kicks off the weeklong La Fiesta de Santa Fe, or the “Fiestas.” Event proceeds benefit local children’s charities. Photo by Jen Judge. And many, like my brother-in-law, come from far away. A few months ago he emailed me about scheduling a visit. “When’s Zozobra this year?” he asked. “It’d be good to watch him burn again if possible.” Yes, it would, I replied. Yes, it would. 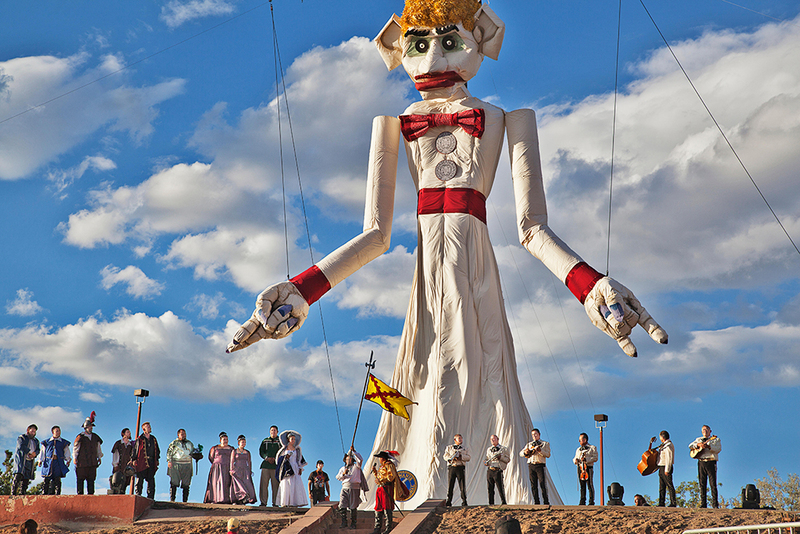 The 92nd Annual Burning of Zozobra will take place on Sept. 2 at Fort Marcy Park in Santa Fe. For information and tickets visit burnzozobra.com.